I sat amidst the casuarinas, gazing at the silhouettes of the tall trees against the setting sun. Slowly the crowds strolled in and push carts did brisk business while camels and horse carts made their way on to the beach. The sun was all set to retire for the day and myriad hues of red, orange and pink splashed across the horizon. People strolled on the sandy beach, kids played cricket and the camel trudged on the sands carrying one visitor after another. Dahanu beach is probably one of the best beaches in Maharashtra, north of Mumbai. It offers one of the best sunsets along the Konkan coast. It was a nice ride on the western express highway from Mumbai, past the traffic at Mira Bhayandar and onto the open road that headed further north. A diversion at Kasa from the national highway took me to Dahanu. Enroute, just before the small coastal town, I had the most delicious mango juice ever. That too for just Rs.10/-. I couldn’t resist the urge to have one more and gulped down one more glass before riding further to Dahanu. 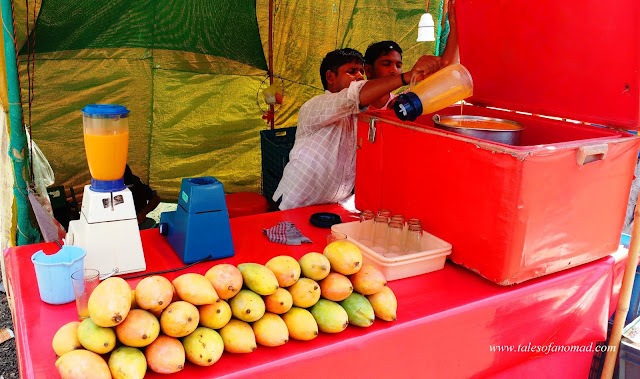 It was summers and the coastal towns are flooded with the country’s best mangoes during this period. At the southern end of Dahanu, past the colourful houses lies the fort of Dahanu. Dilapidated and with branches of trees clambering all over its walls, the fort has now become a government office. The fort was built during the times of Portuguese when they had control over this region. The region also has numerous Parsi families who had settled here years ago. I strolled around for a while before heading to Parnaka beach, the main beach in Dahanu. Lined with casuarinas, this long beach is pretty well maintained and with the sea receding during summers, it’s an ideal place for an evening walk. Despite being a small town and a weekday, the crowd swelled up as the evening progressed. The beach also offers numerous activities such as camel rides, horse carts and ATV rides in the evening. Sunset here is absolutely mesmerizing as the sky slowly turned into a painter’s palette. From gold to orange to pink, the sun splashed lovely colours across the horizon and the silhouettes accentuated its charm. It was a memorable way to end the day. Next day, I headed to the more popular Bordi. The stretch between Dahanu and Bordi is a beautiful one and has the sea on one side and innumerable chikoo (sapodilla) orchards on the other. Golvad, a small town in between is known for its excellent quality of chikoos. Though the sea runs parallel for a long stretch, Chikkale beach is the most popular one. A long beach with casuarinas trees, it was absolutely devoid of people when I visited. As the sun mellowed, I reached Bordi, which has one of the longest beach stretches in this region. At almost 15 Kms, Bordi beach is an absolute delight for beach lovers. The casuarinas trees are comparatively lesser and the beach is quite well maintained. Another attraction on this black sandy beach are the numerous semi submerged trees on its left which look gorgeous. The similarities between the beaches of Dahanu and Bordi are its crowd and stunning sunsets. There were evening walkers, kids playing cricket, families on vacation, pushcarts, camels and lot more. However, that did not make Bordi beach any less attractive. Once the sun spread its hues over the horizon, all other distractions stayed away from the frame. All that I could see were the glistening waters, the setting sun and the colourful horizon. The stretch of Dahanu and Bordi might not offer lots to the visitors and with a couple of power plants that have sprung up, they might not be up on the travel list of holiday makers. Despite all that, the long sandy beaches and the breathtakingly beautiful sunsets are definitely reasons to head to these coastal towns which are a short drive away from Mumbai. Dahanu is 142 Kms away from Mumbai. It is well connected by roads (NH-48) and trains. Bordi is 18 Kms from Dahanu. The closest airport is in Mumbai and the nearest rail head is in Dahanu. There are numerous hotels and home stays available in Dahanu and Bordi near the beaches. I stayed at Sea Crest beach resort. Most of the hotels have restaurants that are open to non- guests too. Crazy Crab restaurant serves delicious sea food. Beautiful unknown beaches of India! A very inviting place, both the beach and the way to it. The beaches of Dahanu and Bordi looks so charming and the sunset res are absolutely gorgeous! Lovely pictures of these lesser known beaches. Beautiful place! You introduce me to all the nice places around Mumbai...and I'm not aware of my own backyard! Glad you liked it. Head out soon.